During the years after the end of the cease of both gold and phosphate exploitation, which coincided with the beginning of World War I, Aruba fell back upon agriculture and fishery. Poverty and regularly recurring famine were the order of the day. In the twenties, matters changed drastically when Curaçao and Aruba came into contact with the oil industry. On Curaçao, an oil company started building and therefore stones and sand were gotten from Aruba. For that purpose even a motor ship entered the Paardenbay for the first time in August 1924. In August of that same year a company of three gentlemen who first had been in Curaçao, came to Aruba. The party, headed by Captain Robert Rodger and employed by the British Equatorial Oil Company, was searching for a suitable place for a harbor where oil from Maracaibo could be transshipped. This oil was extracted in Venezuela by the Lago Petroleum Company. On Curaçao they found out that all the suitable locations had been taken by other companies. 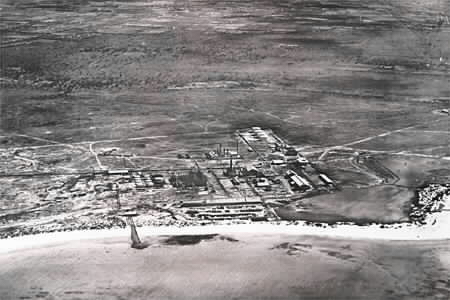 Richard Beaujon, a pilot who worked in the Curaçao harbor, succeeded to draw the attention of the gentlemen to a suitable place on the neighboring island of Aruba, where an excellent location for a harbor existed in the Sint-Nicolaasbay, that had not been used since the end of the phosphate exploitation. On Aruba, the visitors were welcomed by John G. (“Dudu”) Eman, who was tipped off by Beaujon. They took residence in the only hotel in Aruba at that time, the Pension Aruba in Oranjestad. The gentlemen came to look for a place to establish a transfer station for crude oil, coming from the Lake of Maracaibo. The Lago Petroleum Company had bought the British Equatorial Oil Company and that was how the Lago Oil and Transport Company Ltd. had been founded. John G. Eman , who acted as host to the gentlemen, took them by car to Sint Nicolaas, not an easy trip by all means, since the road led to the other side of the island through the Frenchmen's Pass, over a rough cunucu dirt road! Once they had arrived in Sint Nicolaas, they were offered hospitality in the Eman family country house that was built in 1880 by Hendrik Godfried Eman. The gentlemen stayed fourteen days and during that time, meetings were held with acting governor Quast. One of the topics was how to make a waterway through the reef in the Sint-Nicolaasbay. After two weeks, Rodgers and company left but they were back a month later. The decision had been taken to build a transfer station for crude oil in Sint Nicolaas. However, there was no question at that time of building a refinery! Before the storage tanks were ready, the transfer of crude oil had to be done in a different way. For that purpose, the steamship Invergarry of the Lago Oil and Transport Company was stationed at Oranjestad. At that time, the harbour did not yet exist as it is now: there was a pier at Taratata, just passed the fishing community of Rancho, where ships could moor. That was where the Invergarry was situated and that boat served as a storage for oil that was brought in from Venezuela by so-called lake tankers, that were so shallow that they could sail in the Lake of Maracaibo. Bigger ocean tankers came to the Invergarry to fill up with oil to be transferred to other destinations. This situation remained like that until the opening of the harbor in the Sint-Nicolaasbay in 1927, after which the "mother ship" was discontinued. 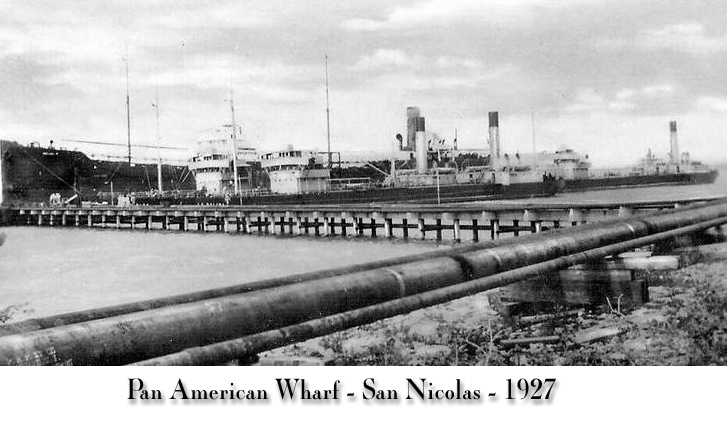 Since 1925 a lot of work was put into the completion of the Sint-Nicolaas harbor and the construction of the oil tanks. On November 17, 1927 the complex was opened officially. In December of that year the Governor of the colony of Curaçao, Brantjes, paid an official visit to Sint Nicolaas, where he ' reviewed the constructed works’. He also visited the refinery that was under construction on the other half of the island, the Arend Petroleum Maatschappij (Eagle Petroleum Company). The establishment of this refinery was a reaction by the Dutch/English Royal Shell-group, established on Curaçao, to the activities of the American company on the sister island. This refinery started operations under the name of Compañia Mexicana de Petrole el Aquila S.A. and was an independent part of the Royal Shell. On Aruba, the company was in business under the name of ’Arend Petroleum Maatschappij', but everybody used the English name 'Eagle'. 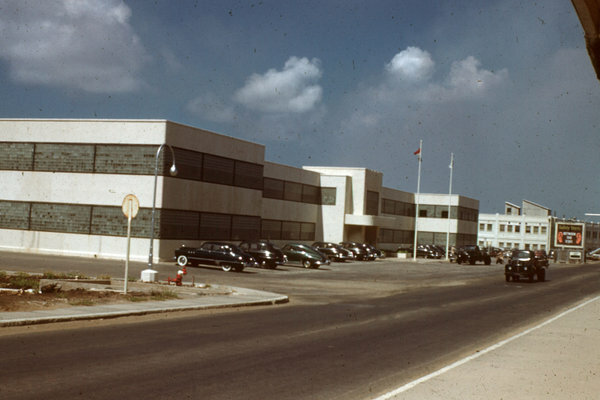 The refinery was built to the west of Oranjestad, its head office is still used as the office of the ATA and the AHATA. A pier was built near Punta Brabo where the tankers could moor. From there, a railway was built to the refinery. The Eagle itself had three tankers running to bring in crude oil from Maracaibo. In April 1928 these operations were started.. 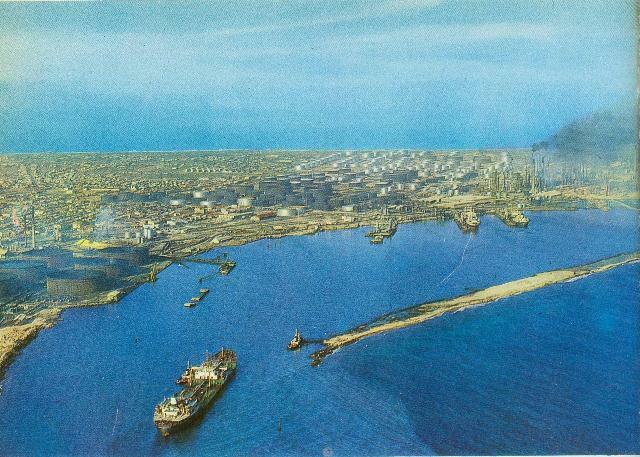 In June 1928 the first oil, refined on Aruba was delivered by the Eagle and exported to Argentinië. 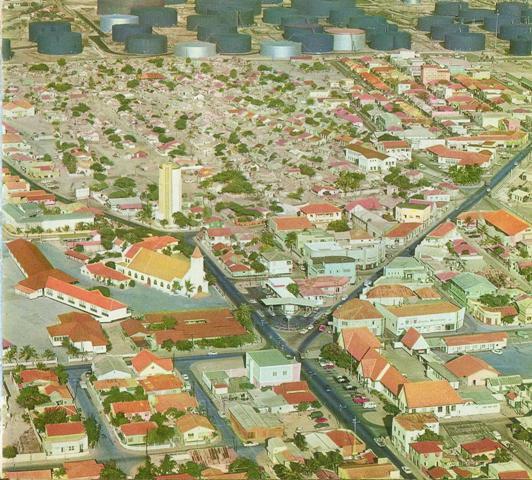 For the management of the refinery, a housing estate was built between Oranjestad and the refinery. That neighborhood and the houses from that time, mostly nicely restored, still exist and, together with the head office mentioned above, they are the only permanent fixtures that still recall this almost forgotten chapter from the history of Aruba, The Eagle . When Lago established itself on Aruba, the contacts with the Eman family were, from the earliest beginnings, of the utmost importance: “Dudu” Eman acted as ‘agent’ and ‘coordinator’, Cornelis (“Casey”) Eman took care of arranging office space for Lago in the three-story house his mother owned in the Nassaustreet. De firm of John Gerard Eman took care of the supplies for the company's ships and supplied local money whenever the Lago needed any. Hence, the John G. Eman Bank, later called Aruba Bank, originated in 1925. In the Eman country house in Sint Nicolaas, the Lago set up their second office. It had been bought from the family for a bargain. The Lago too proceeded to get crude oil from the Lake of Maracaibo with its own ships. The Lago Shipping Company was established in 1925 and the number of lake tankers grew from 7 in 1925 to 29 in 1953. The improvements of the harbor in the Sint-Nicolaasbay were supervised by captain Rodger: in 1937, the westward entrance to the harbor was dug out through the reef. This made it possible to come into the harbor without difficulty, even at night. The deepening of the Sint Nicolaas harbor continued until after World War II, after which it was the turn of the Oranjestad harbor. More and bigger piers were constructed, which continued to increase the capacity. In the meantime the hamlet of Sint Nicolaas grew from a few huts to a decent village, with buildings and sheds that were part of the oil transfer station and houses that were built for the employees. 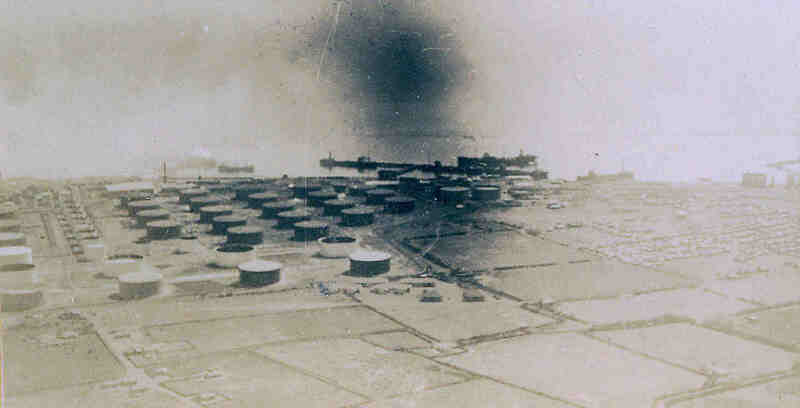 In the same year that the transshipment harbor was opened, the decision was taken to establish a refinery at Sint Nicolaas. The company was searching for some time for a spot near the lake of Maracaibo, where the crude oil could be processed at once and shipped to other destinations. The most important man for the establishment of the Lago-refinery was Lloyd G. Smith who became general manager in 1933. He retired in 1946. The new coastal road from Oranjestad to Palm Beach was named after him. 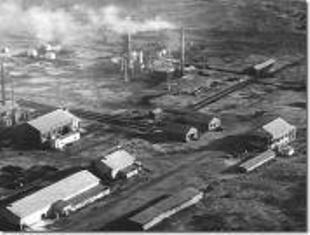 In February of 1928, the definitive decision was taken to establish the refinery. In that same month, construction of housing projects for the personnel started. Towards the end of that year, the power plant was also finished. In January of 1929, the refinement of oil could begin. In the first years, enormous investments were made in expansion works: 22 million dollars. In that same year, the firm also changed ownership: the Standard Oil Company of Indiana bought the entire company. In 1932, the business was transferred to the Standard Oil Company of New Jersey. Since then, the name ESSO as a trade mark was definitively connected to the Lago. The expansion of the refinery continued constantly, so did the construction of housing projects: the management from the USA was lodged in the so-called ‘Colony’ , a residential area that was separated from the rest of the island where only residents of the bungalows had access. They even had their own hospital, equipped with state-of-the-art material. They had their own police force, their own protestant church and an American High School. Outside of the ‘Colony’, housing projects were built for the local personnel, a separate neighborhood for each of the ranks of the hierarchy. In 1937, construction of Lago Heights started 150 houses. In 1939 it was Essoville with 75 bungalows to start with. In 1947 a start was made with the public housing project in Lagoville: a savings arrangement enabled the employees to become owners of their houses in the long run. And beyond the quarters, built by Lago, there also was a neighborhood in the centre of what later was to be called San Nicolas, where houses were built in a hurry and in the style of the English-speaking Caribbean islands: The Village. In just over a quarter of a century, Lago grew to become one of the largest oil-producing companies in the world, employing about 7000 people from 56 different countries. A majority came from far away, from the islands in the east of the Caribbean like Grenada or St.-Vincent or sometimes from even farther away: Surinam or Madeira. With the immigration of people of different origin, San Nicolas also became a melting pot of cultures and religions. English was generally spoken here, while hardly anyone spoke that language elsewhere on the island. This part of the island also became famous for its music, particularly that of the Aruban carnival, which originated here. 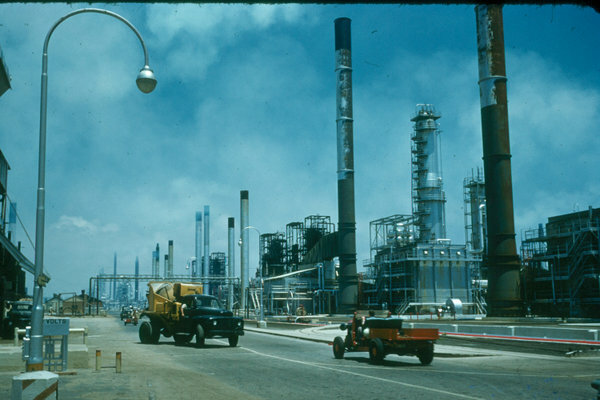 Within the refinery, an increasing number of Arubans rose to positions of responsibility: courses were given and more and more Arubans were trained to be foremen in the company. The production of the refinery also grew in an explosive manner: in 1945, sixteen years after the opening, the first billionth barrel of crude oil was refined, seven years later, in July of 1952, the second billionth barrel. The other oil refinery on Aruba, the Eagle, stopped functioning in World War II since it produced no jet fuel. The personnel were employed at the Curaçao refinery. 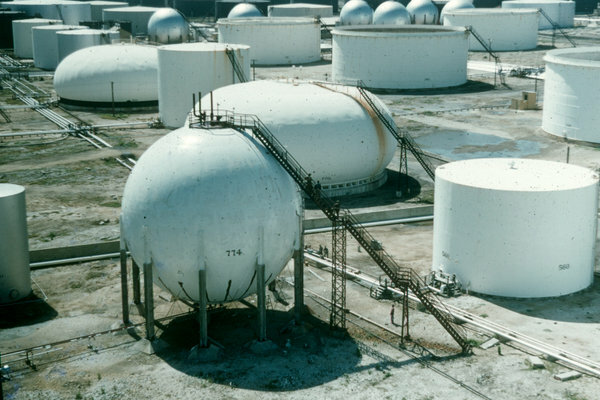 The oil tanks that stood empty on Aruba were used by Lago as storage. After the war, the production of the Eagle was not continued and the installations were dismantled. The arrival of the Lago Oil and Transport Company has been the most radical event in the modern history of Aruba. It brought about major changes for the island and its population. The standard of living increased quickly, which was a luxury that was quite new for a small Caribbean island. However, increasing automation had as effect that the number of employees decreased steadily. Out of 8300 people who worked for Lago in 1949 (16 % of the Aruban population!) only 1350 were left in the beginning of the eighties. Due to rising losses, the outdated and obsolete Lago refinery closed down in 1986. The refinery stood empty for years and just about when there was talk of tearing it down, a new candidate came up who wanted to continue business: El Paso Corporation from Texas, an oil giant that had taken over the Coastal Oil Company from Houston. Lago became Coastal Aruba in 1991 but in 2004, the refinery found itself in new hands again: another oil giant from Texas, Valero, saw its possibilities. The lack of environmental rules for a refinery on Aruba might also have played a role in this decision: the only existing rule here: not to spill oil on the water . . . . . . In the mean time, Valero Aruba still keeps the about eighty year old refinery running. More than 640 million dollars have been invested in the past years. At this moment, the production stands at 275.000 barrels a day.